Vocaletarian revolution. Vocaletariat is a class of people using Vocaloid. Just like animetariat, and I’m sure many vocaletarians and animetarians overlap. Vocaloidian. Vocaloidist. Vocaloidism. Mikunopolis was surely revolutionary experience. Mikunocracy. Mikunocrati. Mikunology. Mikunolepsy. Mikunomancy! Vocaloid such as Hatsune Miku is a new god. Traditionally, idol has been a 3-D person. So, it’s been an actor/singer playing the role of idol. She becomes an idol when the idol possesses her. That is the concept of acting. The Japanese word for “acting” is haiyuu (俳優), which originally meant “possession by god.” Uzume was probably the first idol in Japan. She was the first entertainer, dancer, comedian, actor, musician, and singer. Yes, the first Geigi, or Geisha. The first literature is always mythology in any culture. So, characters from the first literature are gods, and actors played gods. So, it makes sense that acting was divination, e.g., Orishas. That’s how we used to invite marebito. But after the advent of Vocaloid, we don’t need a person to play Eshu-Elegba anymore at the crossroads. Just like S1m0ne, computer generated actress, replaced real actress. And Miku, computer generated idol singer, replaced real idol. Vocaloid requires no 3-D person to act. Yes, no miko (female shaman) needed. The earliest music theater in Japan was kagura (god’s music). Uzume’s descendants, collectively called “Sarume,” performed kagura. And now the latest kagura is Mikunopolis. Therefore, Miku is the direct descent of Uzume. 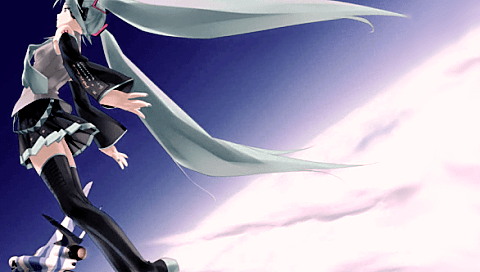 And Miku is definitely a neo-marebito. Idol is fictional character, since it’s not real. Analog idol was a fake person, in other words, a fictitious person since real person played idol. In the analog time, we used to need a miko to listen to god. But we don’t need a miko anymore. We can listen to god directly. Yes, digital idol! Vocaloid idol is not fake. It’s not fictitious. It’s authentic. It is as it is! Que es, es. Now folks like us can make music as they wish. We don’t need to hire a good singer to perform our songs. We don’t need studios to produce music. So, it’s totally folks-oriented. Anyone can write music with Vocaloid. I wonder what if Stevie Wonder uses Vocaloid to create music phrasing. He is the one who knows how to bring out the potentiality of each music instrument. Even a very primitive cheesy synthesizer like Moog, if Stevie Wonder uses it, it sounds like the greatest instrument ever. Is this vocaletarian revolution rather than proletarian revolution? 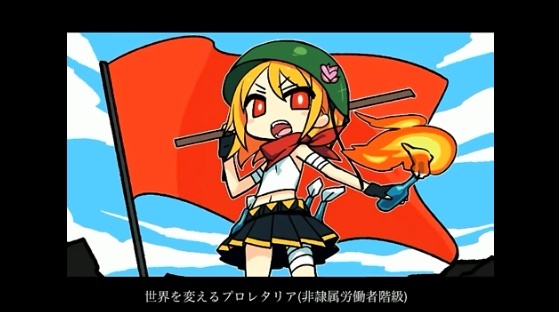 Well, Kagamine Rin advocates proletarian revolution. But people engage in labor are still slaves, because labor is what only slaves do. Labor doesn’t make you free, but it makes you a slave, just like Albeit Macht Frie. It doesn’t free us from labor. Proletarian revolution makes us all underprivileged rather than noble. In turn, vocaletarian revolution makes us privileged. Once only successful professional composers were able to hire idols. But now, anybody can have idol to perform their music. Access is power. The Internet has enabled everyone to access information, and Vocaloid has enabled everyone to access idol. Mikunopolis is an inheritor of Fritz Lang’s Metropolis. Or Tezuka Osamu’s Metropolis. Idol is the mediator/messenger between composer and listener. But now, the mediator doesn’t need to be real person. Thus, Fritz Lang’s prophesy comes true. And that is Mikunopolis! this is a terrible joke post. I wrote it quite seriously. The photos of Miku Hatsune reflects that it is a hologram.. I wonder if my eyes deceived me though. It looks like it on the photos. But, it was actually a projected image on the screen. That sounds so unattractive.. T_T Compare to Kalefina. >__< 3-D goes for only the figures! Well, that kind of technology is yet to come.